Although the association between low birth weight and sarcopenia is well established the underlying mechanisms are not understood. We have recently shown that is feasible to collect muscle tissue from older men and women living in the communityref9. This has enabled us to embark on mechanistic studies. 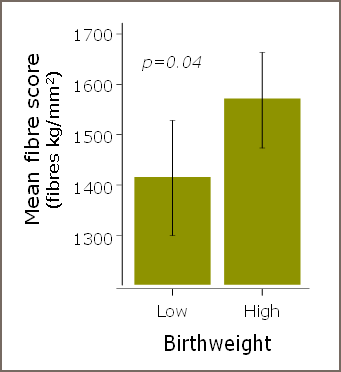 Our first investigations assessed differences in muscle morphology; in older men who were of lower weight at birth weight, their muscle fibre score (a proxy of total fibre number) was reduced (see figure). This difference could not be explained by effects of age, height or level of physical activityref10. The sample size in our first exploratory study368 9 was relatively small and only included men. In collaboration with the NIHR Southampton Biomedical Research Centre in Nutrition, we have therefore extended the Hertfordshire Sarcopenia Study to carry out muscle biopsies in older women as well as in a larger number of older men from the Hertfordshire Cohort Study. All participants have historical records of birth weight and have already had detailed phenotypic and genotypic characterisation. The fieldwork involves a home visit for administration of health and lifestyle questionnaires followed by attendance at the Wellcome Trust Clinical Research Facility (WTCRF) at University Hospital Southampton NHS Foundation Trust for detailed clinical investigations, that include a muscle biopsy. The mechanistic work is being taken forward in collaboration with national and international centres of excellence in muscle biology.